School shoes for Latifa and church shoes for Maulidi. Editha is a Seventh-day Adventist young lady not yet 30. While she was in secondary school, a man raped her in a vain attempt to rid himself of AIDS. As a result, Editha not only contracted HIV but also gave birth to a baby girl she called Latifa. Although she failed secondary school, Editha went on with life, thinking little of her disease. Leaving Latifa with her mother, the young woman moved to the big city to work as a maid. In 2016, she started feeling very sick and losing weight. Returning home, she went to the doctor to receive the dreaded “prolonged life” medicine. Soon, she developed vitiligo, a skin disorder characterized by the patchy loss of skin pigment. Now that her disease was obvious, nobody would hire her. Today Editha lives in the village near us with her mother, her younger brother Maulidi and Latifa. The family survives off their little field high up the side of Lukinga Mountain, about an hour and a half of hard hiking from their home. Although we do not have much work for Editha, we want to help. Since it is not our policy to hand out money, we give Editha a little work in the school garden with the team at https://rkcconstruction.com/services/patio-covers/. Despite her sad past, Editha is always smiling. She enjoys visiting people to encourage them and pray with them. Although her mother does not attend church, Editha, Latifa and Maulidi come each week. For months, they wore the same dirty, worn shoes and clothes they wore all week. Editha’s clothes were twice too big for her, Maulidi’s toes poked through his shoes, and Latifa had long since outgrown her outfit. 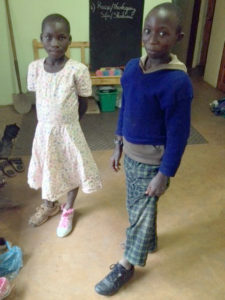 Latifa receives new shoes for church. A few months ago, when Latifa arrived early for a wedding at our church, we remembered the clothes we had at home, sewn by our students to be distributed to orphans. Taking her to our house, we pulled out four outfits and asked Latifa to choose one for the wedding. We also gave her a little straw hat and some skin cream. Soon after, we bought church shoes for Latifa and her mother and a pair of pink tennis shoes for Latifa to wear to school. At Kibidula, a friend allowed us to choose clothes for the whole family from donated clothing received in a shipping container. We found several items they needed, including shoes for Maulidi. After Editha finished work, we called Latifa and Maulidi and opened the bag. Smiles shone on their faces. “Mama! A sweater! I have been wearing the same sweater every day for months.” Latifa pressed it to her chest. The children probably had trouble sleeping that night! Later that day I read: “The poor and suffering who believe in Jesus Christ have the first claim upon our thoughts and ministry. They have the first claim to words of consolation and gifts of comfort. . . . It is the duty of every human agent whether rich or poor to be a channel through which the Lord can send His beneficence flowing to the needy, the oppressed, and suffering, for whom He died.” The Home Missionary, December 1, 1894. Not only is it a duty, but it brings great joy! The Vande Voorts operate Eden Valley Foster Care Mission, a trade school for underprivileged Tanzanian youth. harvester2188@gmail.com; Box 17, Mafinga, Iringa, Tanzania. Be the hands and heart of Jesus! Perhaps someone close to you needs consolation or gifts of comfort. Allow Jesus to reveal His love through your actions! Pray for Elisha and Nadege to be channels of God’s love, not just “missionaries.” Pray that they will continue to have Jesus’ heart for the many in need.